Matt is a huge fan of lasagna and until now, I had never found a recipe that I truly loved until this one by Dallas’ own John Chandler. While sitting in the lobby at Goodyear Tire a few months ago waiting for an oil change, I saw a segment on Good Morning America for the world’s best lasagna. (Watch the clip HERE). The man behind the recipe is John Chandler, a Dallas home cook who posted his lasagna recipe on AllRecipes.com 11 years ago, never thinking it would be the most popular recipe of all time on that website! With more than 8,000 five-star reviews, it definitely lived up to it’s name “world’s best lasagna”. 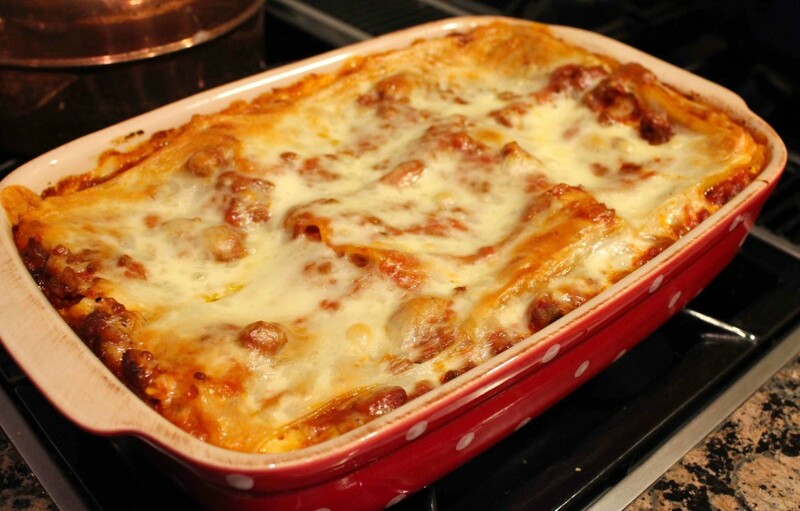 After watching the GMA segment and leaving Goodyear Tire craving lasagna, I made it a point to make this lasagna for Matt and I later that week. And the verdict was??? We LOVED it! The recipe is actually quite simple and uses simple, easily found ingredients from your typical grocery store… nothing weird of fancy; just fresh mozzarella, Parmesan and ricotta cheese, Italian sausage, lean ground beef, garlic, tomato sauce and paste, Italian seasonings, and lasagna noodles. It’s definitely a winner and we’re definitely eating this again! Plus it serves 12 so it would be perfect for a large family get together or party. Enjoy! Brown sausage, beef, onion, and garlic. Heat until meat is browned and cooked through. Stir in crushed tomatoes, tomato paste, tomato sauce, water, sugar, basil, fennel seeds, Italian seasoning, salt, pepper and parsley. Simmer for about 1 1/2 hours, stirring occasionally. Combine ricotta cheese with egg, remaining parsley and 1/2 teaspoon of salt. 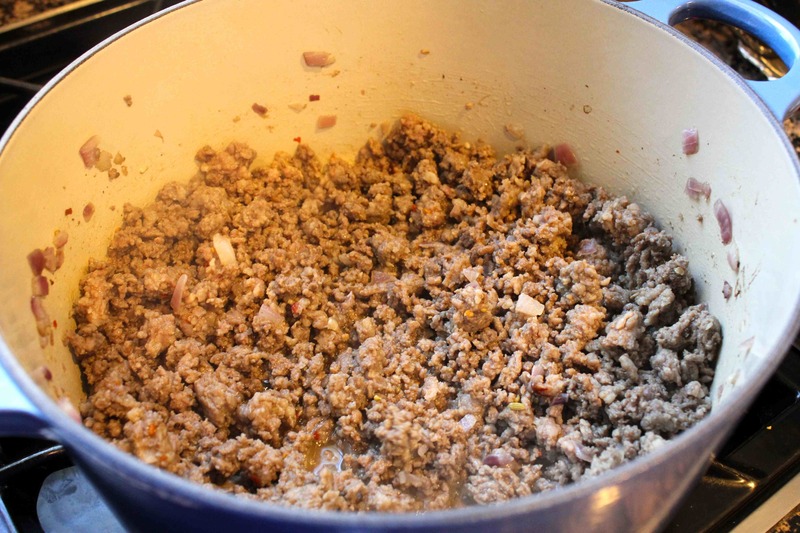 To assemble, spread 1 1/2 cups of meat sauce in the bottom of a 9 x 13-inch pan. 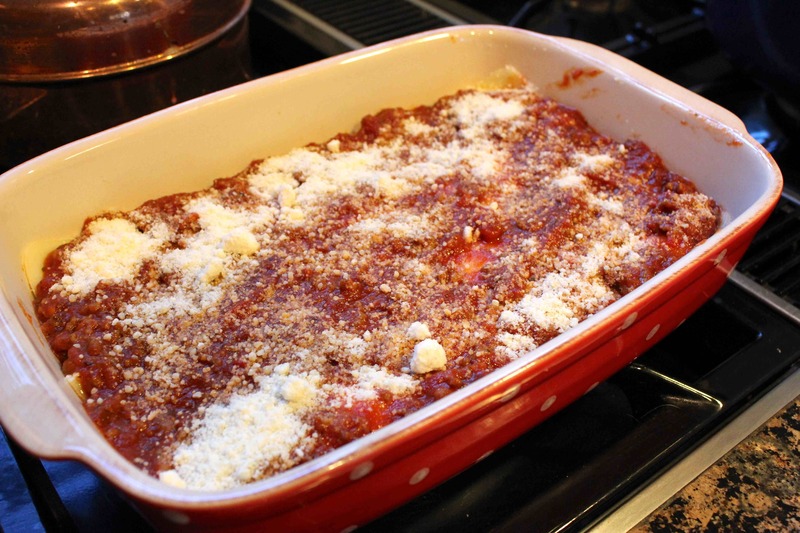 Layer with noodles, half of ricotta cheese, one third of mozzarella cheese and 1 1/2 cups of meat sauce. Bake in preheated oven for 25 minutes. Remove foil and bake an additional 25 minutes. 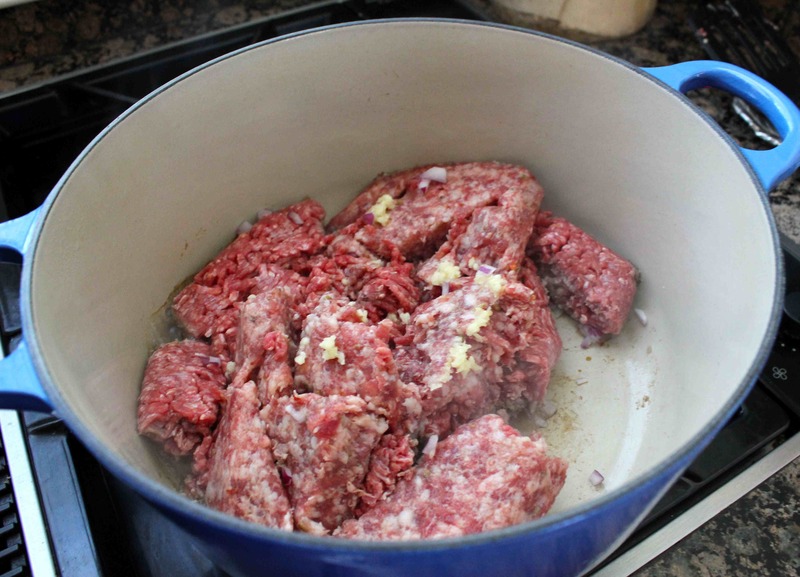 In a Dutch oven, cook sausage, ground beef, onion, and garlic over medium heat until well browned. 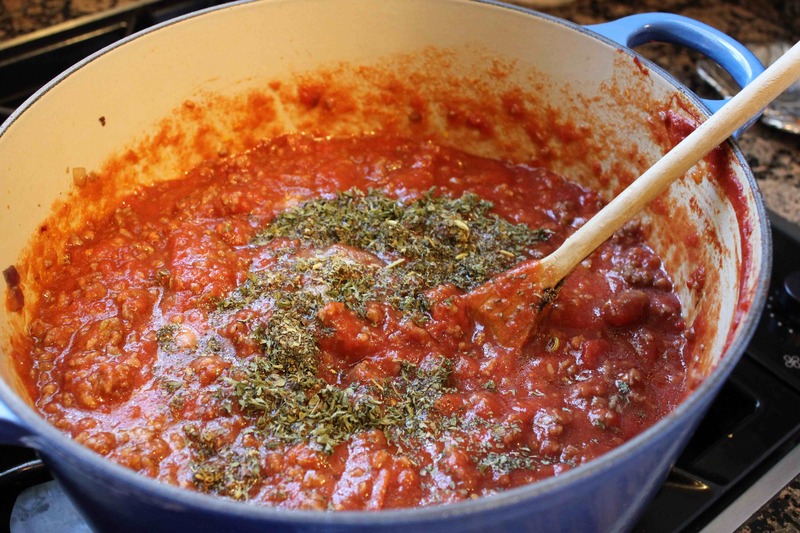 Stir in crushed tomatoes, tomato paste, tomato sauce and water. Season with sugar, basil, fennel seeds, Italian seasoning, 1 tablespoon salt, pepper, and 2 tablespoons parsley. Simmer, covered for about 1½ hours, stirring occasionally. Bring a large pot of lightly salted water to a boil. 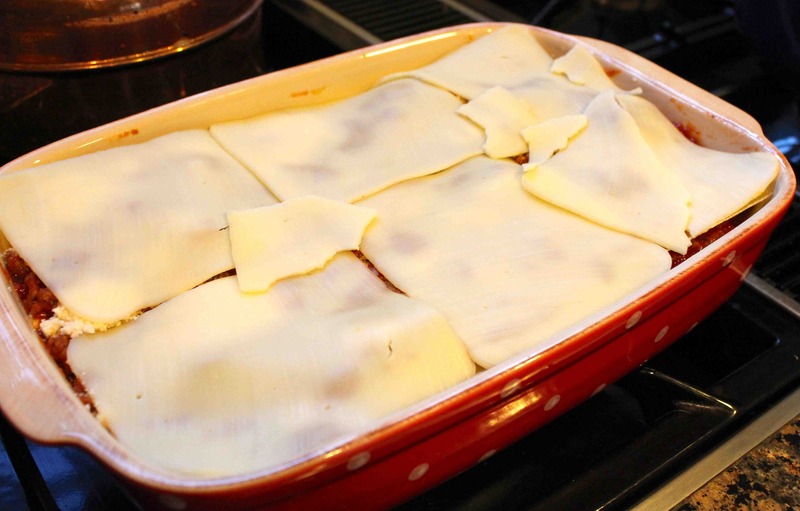 Cook lasagna noodles in boiling water for 8-10 minutes. (Or use no-boil lasagna noodles). Drain noodles, and rinse with cold water. In a mixing bowl, combine ricotta cheese with egg, remaining parsley and ½ teaspoon salt. 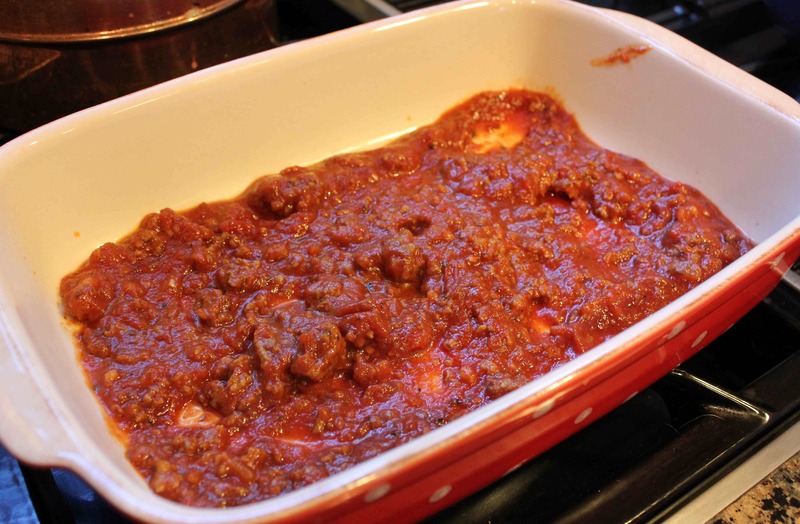 To assemble, spread 1½ cups of meat sauce in the bottom of a 9 x 13-inch baking dish. Arrange 6 noodles lengthwise over meat sauce. 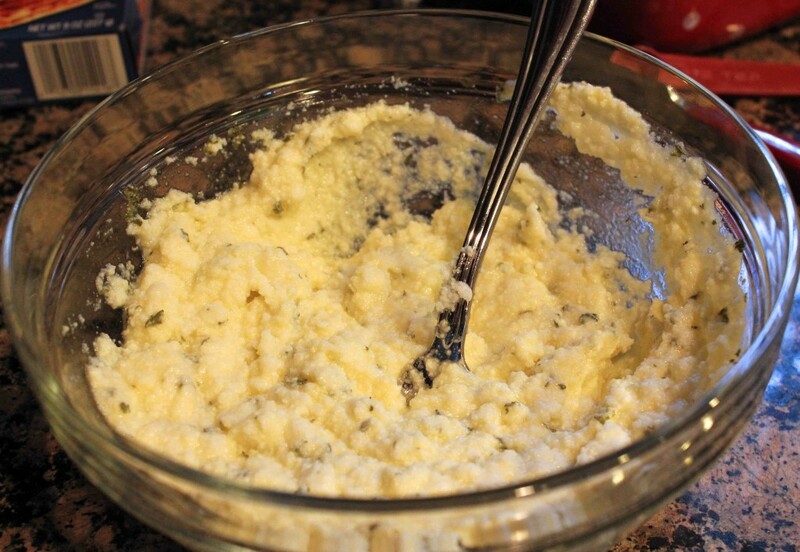 Spread with one half of ricotta cheese mixture. Top with a third of mozzarella cheese slices. Spoon 1½ cups meat sauce over mozzarella, and sprinkle ¼ cup Parmesan cheese. Repeat layers and top with remaining mozzarella and Parmesan cheese. Cover with foil: to prevent sticking, either spray foil with cooking spray, or make sure the foil does not touch the cheese. Bake in preheated oven for 25 minutes. Remove foil and baking an additional 25 minutes. Cool for 15 minutes before serving. 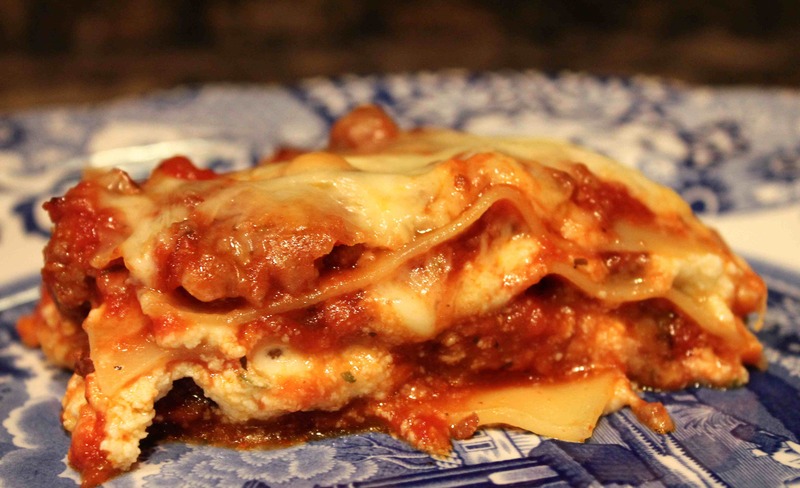 26 Responses to "World’s Best Lasagna"
I made this tonight for my family and it’s wonderful. I love the sauce, zesty and not too sweet at all. I did get confused while layering the lasagna since the recipe directions only include one layer. It’s clear here on the website, but it isn’t included in the printable recipe. I’m sure most people can figure out that you need to repeat the layers one more time, but it might be helpful to include it. Thanks for sharing so many great recipes! Trying Giada’s Shrimp Lasagna Rolls next time! I made this last night for my daughters birthday dinner and everyone LOVED it!! They had second helpings and that’s saying a lot because it is very filling. I was so happy I made this recipe. I think the next time I will decrease the salt just a bit for me personally. Thanks so much!! So glad you and your family enjoyed. That’s just what I want to hear! If you made this last night for your daughter’s birthday, I think we share the same bday! March 3rd! I’ve made this lasagna multiple times and I use this recipe for spaghetti as well. Everyone raves about it and it’s delicious. My sister (who HATES spaghetti sauce of any kind) even raves about how good it tastes. So glad your sister likes it! Would like to serve this at a dinner party… would it work to assemble the day before and then bake before the party? Yes, I believe you could most definitely assemble the day you prepare it. Just make sure to double-check the bake-time, and extend it if necessary. The bake time says 2 hours and 30 min in the corner of the recipe, but the recipe itself says only bake about 50 min. Can you clarify how long this should bake? Thank you! 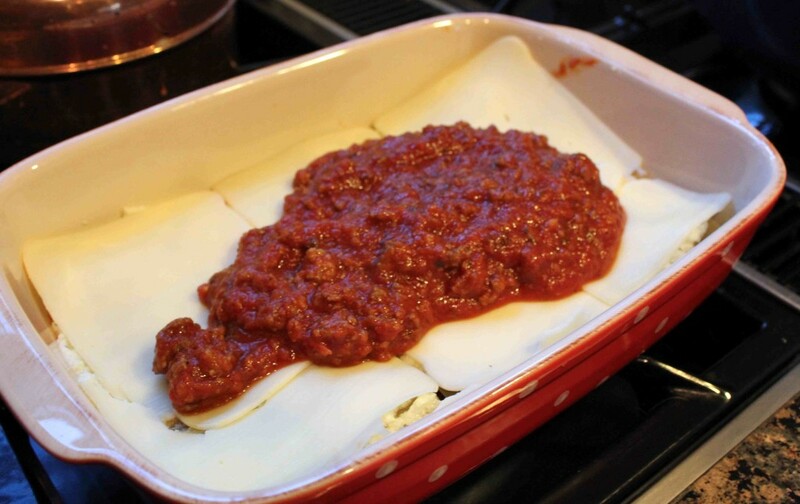 The 2 1/2 hours includes the time it takes to simmer the sauce PLUS bake the lasagna. Hope that helps! Made this lasagna to try and compete with my girlfriend’s Uncle’s “famous” lasagna. Blew it out of the water!! Thanks, this recipe is easy to follow and extremely delicious. It came out perfectly, and I was able to cut it into clean pieces because of how well it all sticks together. Will be making this for years to come. I’ve made this a few times and am just wondering if I’m the only one who is always left with a lot of extra sauce? Think the extra sauce would freeze well? I forget about it in the fridge and hate for it to go to waste. I would say yes to freezing the sauce! Just came across your recipe on Pintrest and am looking forward to making tonight. I’d like to divide it and freeze half as it’s just my husband and myself. Should I freeze before cooking or after? I’d freeze before cooking and thaw in the fridge when you are ready to eat it. Hope you enjoy! Is it okay to freeze before cooking even with raw egg in ricotta cheese? I think it would be okay. I sometimes use small curd cottage cheese. I add egg, Parmesan cheese and parsley. My family really can’t tell the difference with the wonderful flavor of the sauce. I made this recipe last week and it is definitely a keeper. My husband loved it. I froze some of it and it tasted as good if not better when reheated.